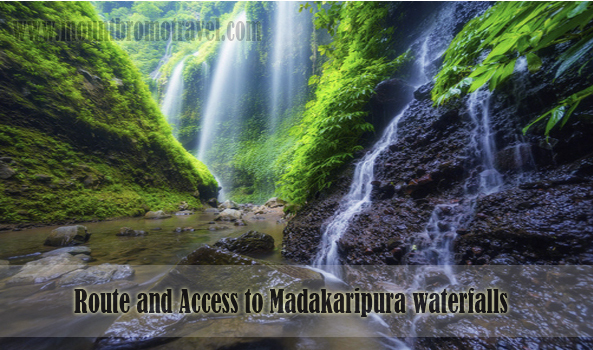 Information of the Route and Access to Madakaripura Waterfalls that you can use. The information of the route and access to Madakaripura Waterfalls is often sought by tourists. Both domestic tourists and international tourists love to visit this incredibly beautiful waterfall located in Lumbang, Probolinggo, East Java. This waterfall site is very suitable for anyone seeking for natural beauty and peace. The beautiful scenery of the waterfall itself and the peaceful nature sounds from the forest arouns the waterfall and also the sound from the sparkling water under the waterfall can make you forget all your problems. If you are planning to go there anytime soon, below is the information of the route and access to Madakaripura Waterfalls. Going to Madakaripura waterfall is better if you are using private vehicle. It is because the location of the waterfall is quite tricky and quite rural. The exact location of the waterfall is in Sapih Village, Lumbang, Probolinggo, East Java. If you want to go to this extremely breathtaking waterfall, you can go through the route to the waterfall through Malang or Surabaya. From Surabaya, the route is: Surabaya, Sidoarjo, Porong, Pasuruan, Probolinggo, and Tongas. From there, you can go looking for traditional market of Lumbang. From the market, go right and there you find the path to the waterfall. From Surabaya to the exact location of the waterfall, it will cost you 3 hours or so depending on how fast your vehicle can go. If you have to use public transportation, you can go to Madakaripura waterfall through Probolinggo. First, you have to go to Banyuangga bus station. It is located in Probolinggo. Then, take the bus to Toggas/Lumbang. You have to inform the condector of the bus that you are about to go to the waterfall. Once the bus stops in Tonggas area, get off the bus and wait for smaller bus or in Indonesia it is called “angkot” that will bring you to the traditional market of Tongas. From there, go looking for ojek or motorcycle taxi and tell the driver to take you to the waterfall. It is quite tricky though to go to the waterfall using public transportation because you have to change from bus, angkot, and then ojek. So, if you want to get there quickly, it is very suggestible that you use private vehicle instead of the public transportation. The information of the route and access to Madakaripura Waterfalls above should be helpful for you. never found any interesting article like yours. It is lovely value sufficient for me. that I may subscribe. Thanks. I need to to thank you for this wonderful read!! your website page and so far? I amazed with the research you made to create this particular publish incredible.